1. Wash the rice and daal. Drain well. 2. Heat oil+ ghee . Add the whole garam masala , fry for a while. Add the chopped onion and fry until soft and translucent. Add the rice and daal . Add ginger paste and salt. Fry for couple of minutes stirring continuously. Now add 4 and half cup of hot water ( sincerice and daal together makes 3 cups, for each cup we have to take 1 and half cup of water). Cover the lid and cook on medium flame. 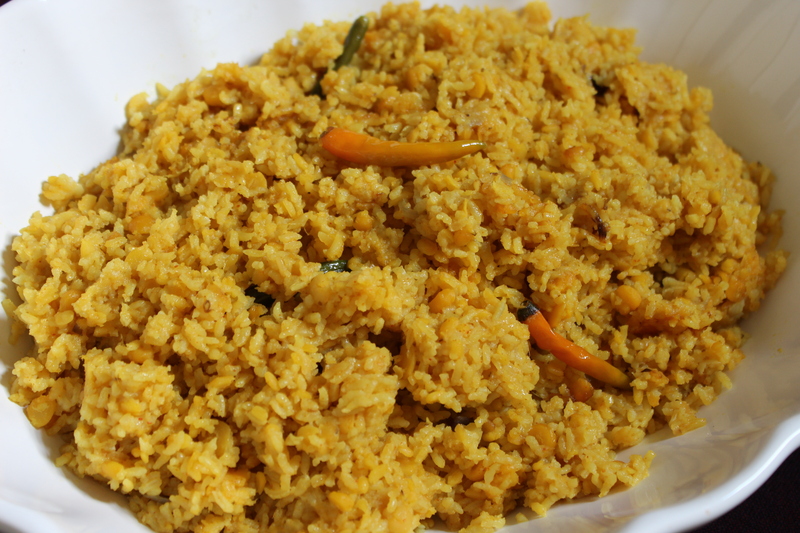 Don’t Stir , otherwise you may end up having gooey type khichuri. 3. When the Water is almost dried out, add handful of green chili and stir only once with a light hand.Cover the lid and reduce the heat to very low. That is what we call “to keep on Dom” . But what I do , I place my pot over another pot filled with water and the steam doeas the “Dom” work. It works nice. 4. Garnish with bereshta ( fried onion) before you serve. 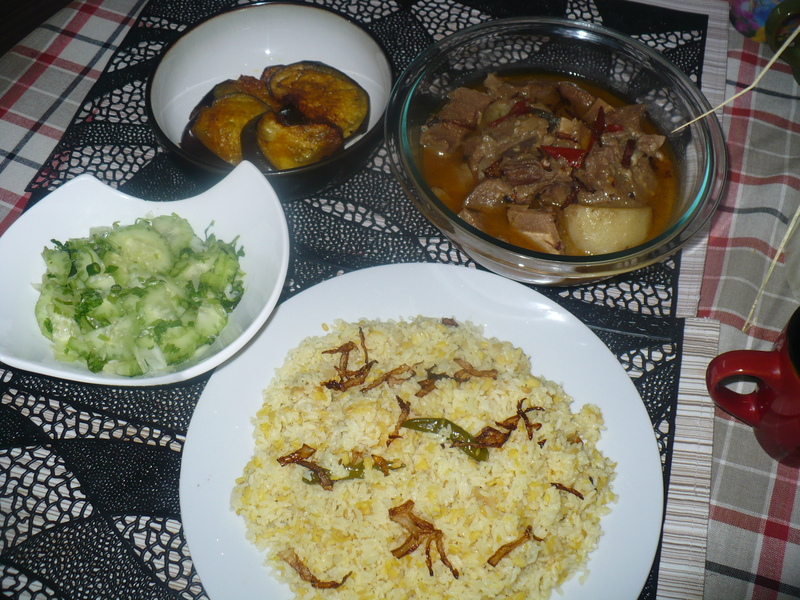 Please check the tips I shared for making pulao. Here’s the link..
Cook the beef in regular way, then in another vessel heat ghee+oil.Add chopped onion and whole garam masala ( bay leaf, cardamoms, cinnamon). Fry until golden brown.Now add ginger-garlic paste, turmeric-chili powder, cumin powder and salt.Now add the aromatic rice and daal (lentil) and fry a while.Add the cooked beef and hot water.You may add vegetables like potatoes, carrots and green peas in it.Cover the lid. Cook on medium low heat. After 10/15 minutes the water will be almost dried out, add handful of green chilies. Now reduce the heat of the stove and cook it on very low flame , which we call to keep on “Dom” in Bangla. 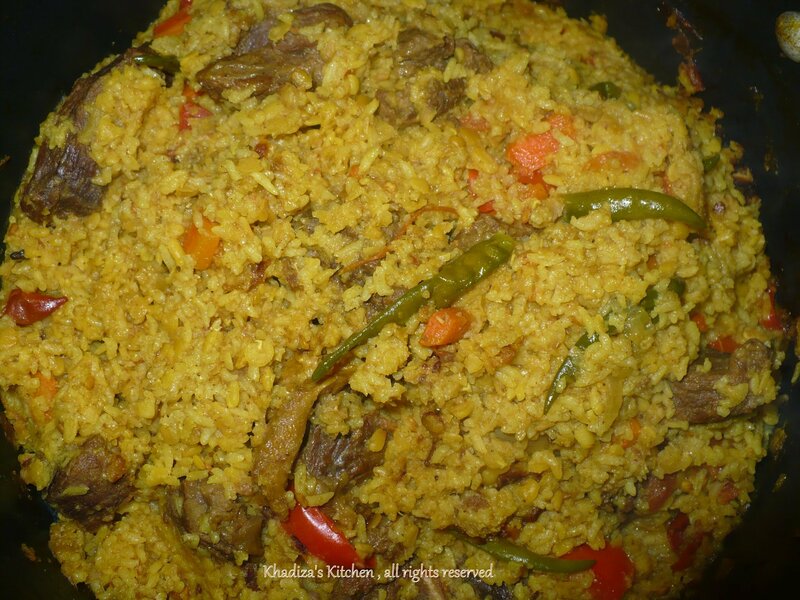 You may use your left over beef curry to make this wonderful Khichuri. So from now on no more wastage!!!!!!!! !